stuffed to the brim and fat with inactivity. I love a pithy saying and have quotations scattered all over my home. Whenever I am in an airport in the US I am drawn like a moth to the bookstore and in the bookstore to the card section and in the card section to the clever magnets. I. CAN. NOT. HELP. MYSELF. Moth meet flame. Amy meet sayings. But it’s much easier to read a proverb than to live it. Look again at the first one, are there any words you skipped over? If you’re like me, you read ‘detests,’ but you didn’t absorb it. Let me say it again: Detests. Not “the LORD is disappointed” or “disturbed.” Detests. In trying to live a less wasteful life she and her family adopted seven greener habits, one of which was partnering with KP Projects. KP Projects will come to your home, plant a garden, and give you half of the produce while helping formerly homeless transition off the streets. Is that not the coolest thing you have heard of today? I share it to show that there are more options out there for creative solutions (even partial solutions) to complex problems than I think. If China is a bit too heavy on only sharing good news, we in the West have gone the other direction and are obsessed with the bad. The Hatmaker family limited their spending to seven places for a month and used the language of “fasting” to describe this month. The poetic practicality got to me. I’ll be honest that in China I don’t shop at that many places or eat at that many restaurants; I “fast” from being around my family, live sports, convenient Western food, and having my own car. But when I read about the rhythms of feasting and fasting, I know that I don’t fast in ways that are forming my spirit. Let’s be honest, I “fast” because I have to, not as an act of obedience that will lead to greater reflection of Christ. I read these chapters and then went on a weekend trip to Qingdao (of Qingdao Beer, strong German influence) with a friend who is researching church bells in China. In March she “happened” on a most inspiring story (read about it here). Sunday morning found us sitting in a church that was designed by a Russian, founded in 1938 in a Japanese controlled area of a Chinese city, holding a German bell dating 1883, attended by Chinese brothers and sisters. Five minutes before the service started they rang their bell for about two minutes. All was quiet in the sanctuary as we prepared to worship. Do you feel the weight of that place? The history? The enormity of the moment? Can you hear the bell? It was not merely a call to worship, but a call to live the stories we were meant to live. We were not meant to be wasteful, selfish people who spend like we are in Vegas, extended beyond our means. No, we are the children of the LORD who wants us to feast, oh yes! He is generous and created a wonderful world. But we must also have times of fasting of helping the poor, the widows, those trapped in injustice. 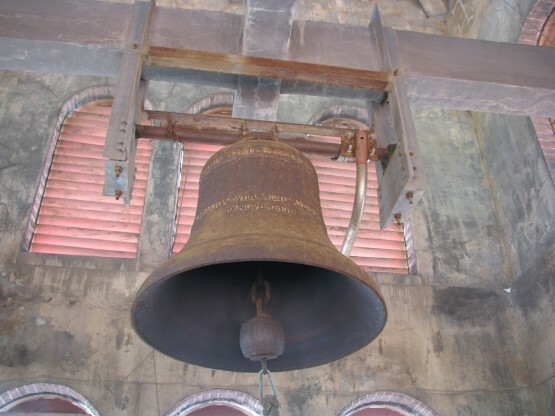 Hear the bell as a call to live a life reflecting feasting and fasting. The clapper hitting one side and then the next. Feast, fast, feast, fast. Really really powerful! I really pray that I would have a better balance, because I know I don’t. Hearing that bell in my mind now. Thanks Katie! Climbing the stairs up, up, up to see it, wow. Janet (you need no introduction! ), me too! I feel like we already know each other :)! I have words all over my house. No, no, not spray painted on the outside, but plastered on walls, desks, in picture frames. They are reminders to me to live out these things I feel passionately about. I love how you tie the reading in with bits of your far away life. Oh and KP projects, my goal today is to research them a bit more. I just left a comment over at another blog saying that I know my town must have something similar as they are uber green and for the first time, I’m willing to put in more than just the minimal amount of effort required. I do like it that organizations like KP makes it easier for us! The truth is that if there isn’t some kind of help, it’s hard to get started. Oh, I love the way you made the bell a balance: feast, fast, feast, fast. I needed that additional visual. I, too, was stopped by Jen’s quote and when I am honest, I am the one going back for second and third helpings. No balance at all, though at least I am seeing that now. Yes, yes, yes! It’s the balance I need more of. Got the feasting down, now to work more on the fasting by choice and not merely by location.